Xayaburi - a battery for Asia? The Xayaburi dam irreversibly destroys livelihoods and ecosystems along the Mekong River, a life-giving vein of Southeast Asia. The Mekong River, a vein of life in Southeast Asia, is among the most bio-diverse rivers in the world and a central livelihood source of tens of millions of villagers living nearby. The construction of the immense Xayaburi mainstream dam, located in mountainous Northern Laos, is drastically changing the life of millions of villagers, leading to irreversible, large-scale environmental destruction, while creating significant transboundary tensions between the Mekong countries Laos, Cambodia, Vietnam and Thailand [1;2]. As part of a series of 11 mainstream dams proposed on the Lower Mekong River, a Memorandum of Understanding (MoU) for the Xayaburi dam was signed on May 4, 2007 with Thai Company CH Karnchang . The 3.5 million dollar project, with a planned capacity of 1260MW of which around 95% will be exported to Thailand , underwent incomplete and flawed impact assessments by several companies [1;2;3]. One of them, Finnish engineering company Pöyry, was later on nominated as the constructor company, despite of an apparent conflict of interest . According to the 1995 Mekong Agreement, mainstream dams require prior consultation of all affected countries via the Mekong River Commission (MRC). The Xayaburi dam was the first that triggered such a process; and while Laos claims to have complied with the agreement, there is evidence that this has not been the case . The MRC urged Laos to postpone the decision for 10 years due to the high risky and unknown impacts, but construction work started in 2011, in spite of disagreement by neighboring governments of Cambodia and Vietnam [1;3]. First villagers were relocated in 2012 and received as little as 15$ of compensation, while resettlement areas were characterized by a lack of infrastructure and food insecurity [1;3]. Once fully constructed, the project will require the resettlement of 2,100 people – for some it will be the 4th resettlement within 15 years . Over 202,000 people from 4 districts will be directly negatively affected in income, food security and livelihoods due to loss of agricultural lands, riverbank gardens, as well as end of gold panning which is an important local livelihood source . On a Southeast Asian regional level, around 2.1 million people will be directly and indirectly affected by ecological and hydrological changes of the Lower Mekong mainstream river , and no less than 60 million people depend on its fish resources . Irreversible environmental changes , to mention a few, will entail potential extinction of 41 fish species while other 23 migratory species will be blocked and endangered, such as the Mekong Giant catfish . 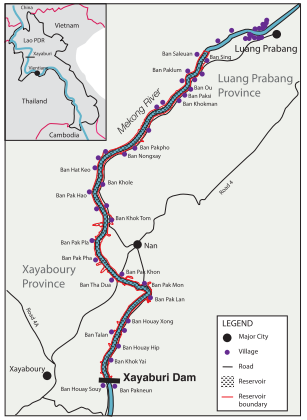 Resistance to the Xayabury dam has become a large transboundary issue, ranging from protests and formal complaints from Lao, Thai, Vietnamese and Cambodian villagers [1;3;6), over highly organized NGO campaigns [3;6;7;8], to governmental complaints from other Mekong countries [1;3]. 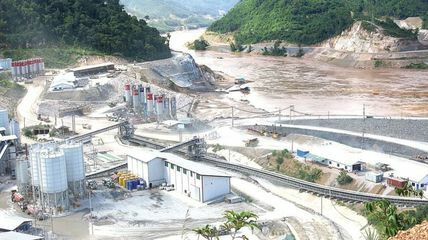 In 2011, 263 NGOs from 51 countries signed a letter to Lao and Thai ministries urging them to stop the dam (Laos) and to step back from buying the produced electricity (Thailand) , however construction work continued. As of march 2014, construction was reported to be completed by 30% . While the Lao government continues to justify the project for crucial revenue generation, it completely dismisses the social, cultural, ecological and economic wealth created by the free flowing river, enjoyed by millions of villagers along the Mekong river basin. 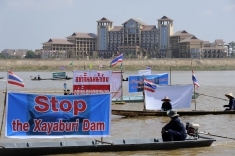 The Xayaburi dam will change this forever, at a large cost, while a few companies will benefit, as well as Thailand, facing limits to the further expansion of hydroelectricity in its own country . Project Details The dam has an expected capacity of 1260MW, a height of 32m, and a reservoir length of 60 to 100km [1;2;5]. The project requires an investment of around 3.5 billion US dollar [1;2]. The dam will be operated by Xayabury power company, whose biggest shareholder is Thai CH Karnchang company, Thailand’s second largest publicly traded company . Other Thai consortium partners are PTT plc; Electricity Generating Company (EGCO); BKK Expressway and PT Construction and Irrigation . The Electricity Generating Authority of Thailand (EGAT) has signed an agreement to buy 95% of the produced electricity [1;3].For this purpose, a 200km long transmission line to Thailand needs to be constructed . Key technology is provided by Austrian company Andritz AG, for which reason the company was filed an OECD complaint about their involvement in the human rights threatening project . First feasibility studies were conducted by Thai TEAM consulting group and Swiss company Colenco . Finnish engineering company Pöyry was hired to check compliance with Mekong River Commission standards, which became later on the construction company . Required loans come from Thai banks Kasikorn Bank, Bangkok Bank, Krung Thai Bank and Siam Commercial bank [b]. These banks are financing the dam in spite of contradictions with their Corporate Social Responsibility Criteria [1;3]. Revenues for the developer CH Karnchang are expected to amount ot 3 to 4 billion dollar per year . Further assessment of all planned Mekong dams: ICEM 2010: STRATEGIC ENVIRONMENTAL ASSESSMENT OF HYDROPOWER ON THE MEKONG MAINSTREAM FINAL REPORT. Prepared for the Mekong River Commission.